Things just keep coming – even if other people do yesterday’s cave temples and today’s event on one day. 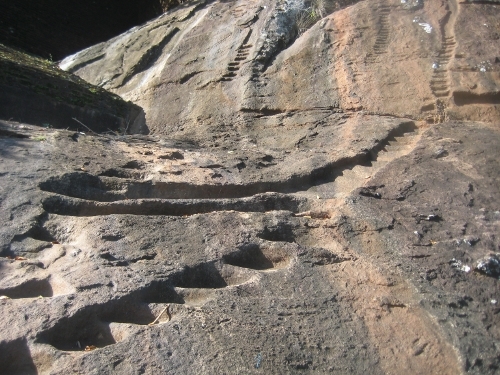 So we did get up early this moring – it could have been even earlier but including the hike to Sigiriya Rock, purchase of the ticket and other preparatory measures we must have reached the foot of this amazing inselberg by about 8:30 am. Zur Bebauung des Bergs kam es im 5. Jahrhundert, als dort eine Festung errichtet wurde, genannt Simha Giri, Löwenberg. Das beruhte auf Stress in der damaligen Herrscherfamilie – Sohn Nr. 2 brachte den Vater um, der Thronfolger flüchtete und der Bösewicht suchte einen sicheren Aufenthaltsort. 18 Jahre hielt er dort durch, dann kam der rechtmäßige Thronfolger aus dem Exil und hat die Dinge wieder gerade gerückt – verlegte allerdings den Herrschersitz wieder nach Anuradhapura (dazu später mehr). 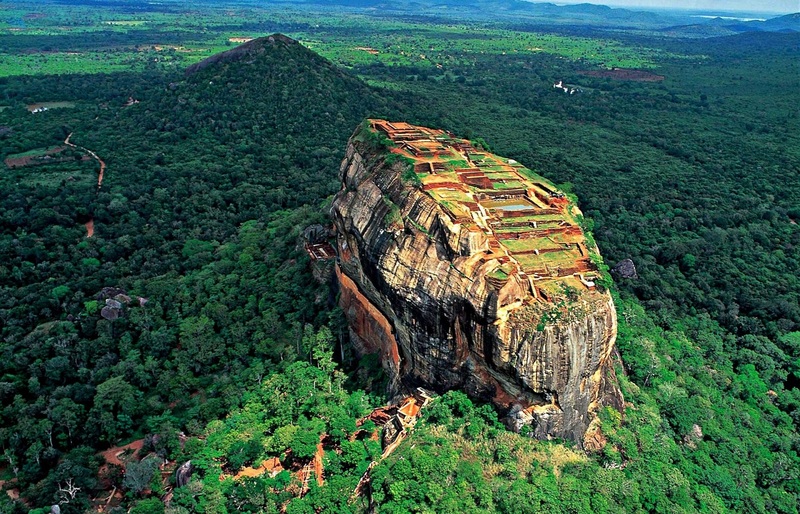 Sigiriya wurde politisch bedeutungslos und war bis ins 13. Jahrhundert ein Rückzugsgebiet von Mönchen. 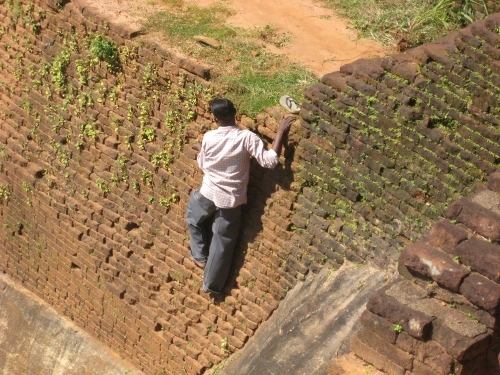 The fortress was erected in the 5th century AD. 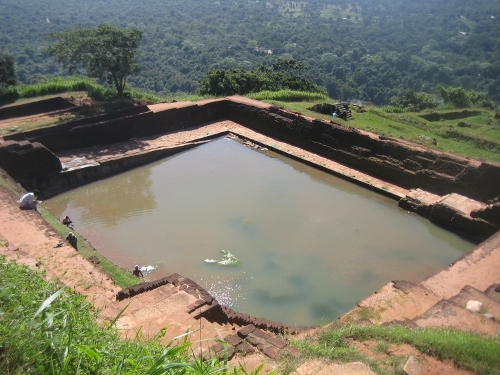 It was called Simha Gri, „Lion’s Mountain“. This happened due to upheaval within the ruling family – son no. 2 killed his father, the rightful heir to the throne went into exile and the bad guy decided this was a perfect location that couldn’t be invaded. He ruled from there for 18 years before his brother returned from exile and set things straight again. 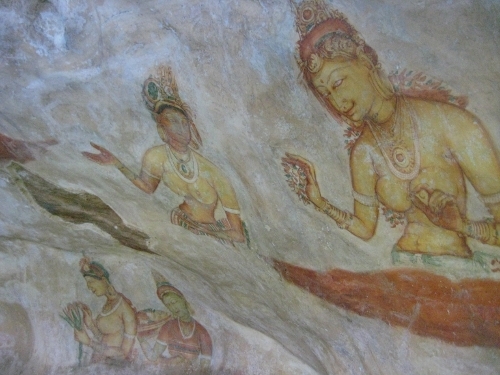 But he also moved the capital back to Anuradhapura (more about this later). 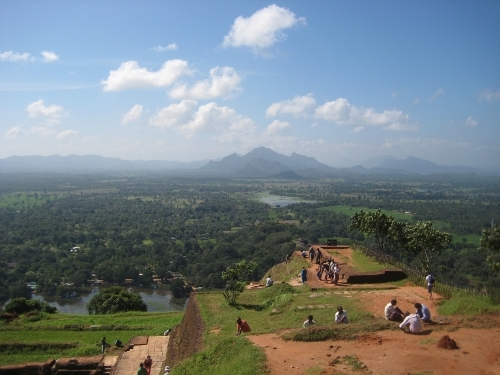 Sigiriya was all but forgotten and was a retreat for monks until well into the 13th century. Man begibt sich über unzählige Treppenstufen, Wendeltreppen und anderes auf die Spitze dieses Bergs, etwa 200m hoch (366m üNN). Durch die Uhrzeit verlief ein guter Teil der Aktion noch im Schatten, was mich aber trotzdem schon im „Lustgarten“ davor ins Schwitzen brachte. Ein erstes Highlight auf etwa halber Höhe (kam mir niedriger vor) sind die Wandmalereien der Wolkenmädchen. Sie wurden auf einer Harz-Kalk-Basis aufgemalt und leuchten noch immer. Auf der Luftaufnahme sind sie ungefähr am Anfang des orange leuchtenden Balkens, aber etwas höher. There are countless steps to climb, regular or spiral staircases to reach the top of this mountain, about 200m/650(?) feet (366m above sea level). 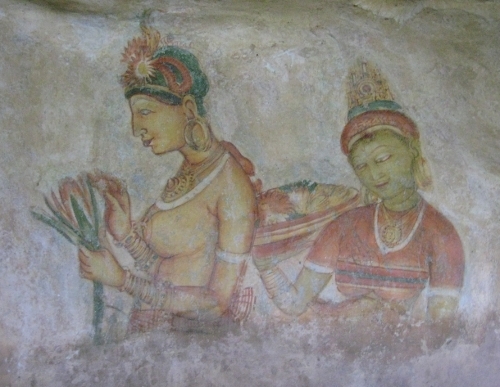 Because we were early, a large part of this was done in the shade but I was already sweating profusely in the gardens… You reach a first highlight at about half the way up (I thought it was well below that…): the murals of the cloud girls. They were painted on a base of resin and chalk and the colors are still vibrant. On that aerial view above they would be somewhere at the start of that broad orange line but a bit above that. An den Mädchen vorbei, muss man wieder runter auf das Niveau der Spiegelwand – besagtes oranges Band. Die verläuft drei Meter hoch an dieser Wand und ein Aufgang ist dahinter. Das Material war so poliert, dass es tatsächlich gespiegelt hat. Dann erreicht man bald ein Plateau, auf dem ehemals ein 14m hoher Löwe saß und den Eingang bewacht hat. Heute sind nur noch seine riesigen Pranken übrig. When you’ve passed the girls you have to descend again to the level of where that aforementioned orange line starts – that’s the so-called mirror wall. It’s 3m/9 feet high and behind it is a walkway/stairs. The material it was made of was polished so that it actually worked as a mirror at the time. A little later you reach a plateau. 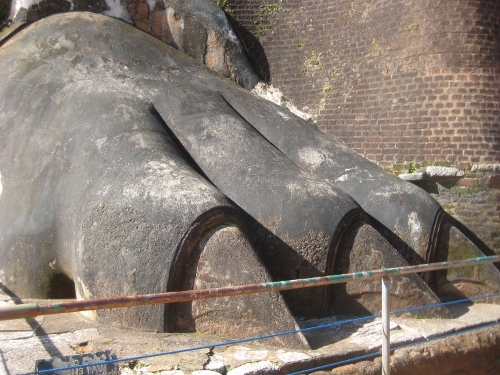 Originally, a 14m/45 feet lion was guarding this entrance but today there are only two of his gigantic paws left. Es waren einige Dutzend Leute mit der Instandhaltung beschäftigt, manchmal an ziemlich haarigen Standorten… Aber wenigstens werden von den 30$ Eintritt auch deutlich sichtbare Maßnahmen unternommen. There were a few dozen people around doing maintenance works, sometimes in rather risky spots… But at least we got a glimpse of what is being done with the admission fee of 30 USD. Gut fand ich auch dieses Schild – ich bezweifle ja noch, dass es überhaupt Hornissen gibt (an anderer Stelle wurde vor Wespen gewarnt), aber es wird die Leute vielleicht eher dazu bringen, nicht schreiend rumzutollen, als simple Verbotsschilder? 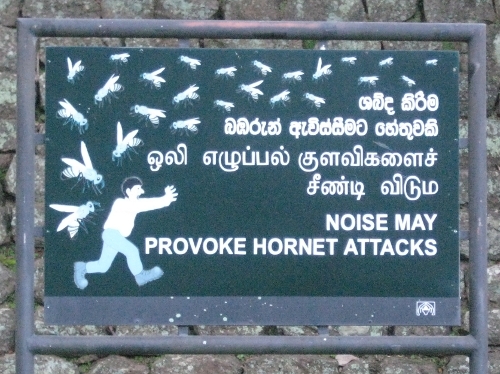 I loved this sign – I doubt that there were actually any hornets (in a nother spot you were warned of wasps) but maybe it’s a better way of asing people not to run about shouting than simply putting up signs saying „Do not…“? Und noch am gleichen Tag haben wir uns auf den Weg nach Polonnaruwa gemacht (siehe Karte oben) – doch dazu wahrscheinlich morgen mehr! 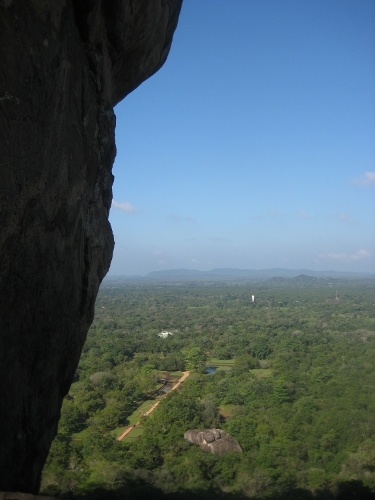 Later that day we moved on to Polonnaruwa (see map above) – but more about that maybe tomorrow! Dieser Beitrag wurde unter On the road abgelegt und mit Sri Lanka verschlagwortet. Setze ein Lesezeichen auf den Permalink. Das frühe Aufstehen lohnt sich ,denn die Bider von den Höhlentempeln und auch von diesem verrückten Fels mitten in der Ebene sind ganz toll. Die Bilder von den Wolkenmädchen sin d anmutig schön.